Loretta Lynn’s last album, 2004’s Van Lear Rose wasn’t just one of the most important albums of Loretta’s storied career, it was one of the most important country albums in the entirety of the oughts. Produced by Jack White, it was the comeback album of comeback albums, and received wide critical acclaim, including two Grammy Awards. It holds a resounding 97 rating on Metacritic. 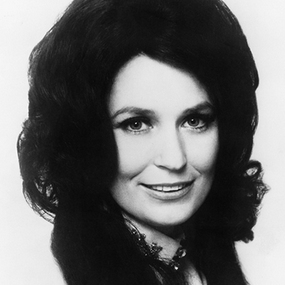 But since the success of Van Lear Rose, Loretta has entered in the largest absent period for albums in her career. Perhaps not wanting to test fate and instead ride out the success of Van Lear Rose as long as she could, ten years have passed since she released the storied album. But all of that is about to change. It has just been announced that Loretta has inked a five album deal with Sony’s catalog album imprint Legacy Recordings, with a new album expected to be released some time next year. Legacy is the same Sony imprint that has been finding great success releasing albums from Willie Nelson during the silver era of his career. Ten years may have passed, but for seven of them Loretta has been at work in the famous Johnny Cash Cabin Studios in Hendersonville, TN on new music that “travels back and explores Loretta’s musical history, from the Appalachian folk songs and gospel music she learned as a child, to new interpretations of her classic hits and country standards, to songs newly-written for the project.” Helping Loretta with the project has been Loretta’s daughter, Patsy L. Russell, and John Carter Cash, son of Johnny Cash and June Carter, and the operator/caretaker of the Cash Cabin Studios. Loretta’s new collection of music is said to include “intimate new performances, the way they might’ve sounded growing up in the 1930s and Forties in Butcher Hollow [Holler].” She’s said to have over 90 songs recorded. Loretta will join a list of country music legacy acts like Willie Nelson, Dolly Parton, Johnny Cash, and Billy Joe Shaver who’ve released successful albums landing in the top of the country music charts as country fans continue to search for the classic sound of country. Here’s a remake of the Conway Twitty/Loretta Lynn duet “After The Fire Is Gone” Loretta worked on recently with Jeff Bates. I was going to question whether she’d be around long enough to put out five albums, but then I saw that she already has 90 songs recorded so she can easily cover that commitment even if she doesn’t sing another note. Definitely looking forward to hearing some of this music. Thank you Jesus. I am looking forward to hearing anything from Loretta. Even if its her just singing the alphabet. And even that would be better than most what we currently hear on mainstream country radio. Welcome back, Loretta!! The “new interpretations of her classic hits” part tempers my excitement a bit, but looking forward to the new music. So pumped to hear about this looking forward do it. What inspires me so much about these kinds of stories is that these legends are still inspired enough by the music to commit the time and energy required to creating it …(.Dolly , Willy , Don Williams , Gene Watson , AJ’s Bluegrass record, Glen Campbell , Vince’s double CD ” These Days ” as well as his Time Jumpers record and gigs , his Bakersfield record and his various writing , recording and producing commitments with other artists . I am ‘ up in years’ myself , comparatively but can relate to their energy and I’m certain there are many many other great artists who still have songs to write and sing if thy knew there would be an outlet for their efforts. Check out Jesse Winchester’s last record recorded just before he passed . A gem top to bottom …substance to the max and that beautiful voice . Just saw Loretta live, she hasn’t missed a beat! Amazing show! I love Loretta and Jack and Van Lear Rose. Looking forward to this next album. I am 48 and when I was growing up I did not like the country music my parents listened to, other than Johnny Cash and Patsy Cline. But I’ve come to have a new appreciation for a lot of it these past several years. I do not listen to commercial country music. I don’t listen to any commercial radio stations – just public radio and my own playlists.